The most extraordinary thing here – among a plethora of quite extraordinary things – is an astonishing arrangement (by Ruggiero Ricci) of Tárrega’s famous guitar solo, Recuerdos de la Alhambra. It takes on an almost frantic quality, at times seeming to out-stretch the physical limitations of the violin. It certainly gets a sizzlingly virtuoso performance here from Sebastian See-Schierenberg, who comes out best on this CD in those pieces where rapid figuration and virtuoso display rule the roost. His account of Xavier Turull’s thrilling transcription of the Albeniz Asturias is nothing if not powerfully assertive and compellingly driven. There is no doubt that See-Schierenberg possesses the kind of florid technique which yields dazzling pyrotechnic displays, and in terms of excitement and vivid rhythmic vitality this disc is in a class of its own; who would have thought an apparently simple selection of Spanish favourites played by violin and piano would have ignited so much fire? But then this disc is not at all what it seems. With the second movement of Falla’s Suite Popular Espanola the surprises pile on thick and fast. The first movement seems straightforward enough, but suddenly with the second (“Nana”) a breathy, folksy voice whispers into the microphone songs of childhood memory, and then, where we might be expecting a piano, a guitar comes along. In the kind of re-imagining and free approach to performance which characterises this entire CD, See-Schierenberg, Sophia Lisoskaya and Ramon Ruiz have decided to mingle piano and guitar accompaniments and add a few ideas of their own. I am not sure it always works in the Falla, where the individual pieces stand well in isolation but fail to coalesce into a Suite; possibly breaking them up around the disc might have been a better idea. That said, this re-imagining approach pays particular dividends with the four tangos which have generally come to be known as Piazzolla’s “Four Seasons on Buenos Aires” (Cuatro Estaciones Porteñas) - and the only real justification in the disc's title for the "Americas" element. . The extensive booklet notes tell us that what we hear on the CD is a “work in progress”. If so, See-Schierenberg and his wonderfully supportive pianist, Sophia Lisovskaya, are very much heading along the right lines, evoking the essence of the tango while conveying a glorious feeling of improvisatory fun – particularly some intriguing violin effects in the closing moments of Otoño Porteño - as they explore afresh what are rapidly becoming classic pieces of our time. Giving over the final season (Invierno Porteño) wholly to the piano is probably misguided, especially given this rather sentimental view of it; it seems so terribly anti-climactic after all the colour and excitement which has gone before, and the ending is undeniably limp. Spanish flavour is reinforced with Campiana Andaluza by the famous guitarist Sabicas (Agustin Castellón Campos), and the only piece on the disc appearing in the guise in which it was originally conceived. Here it is played by guitarist Ramon Ruiz (who is also the endearing vocalist in the Falla). But while a beautifully expressive account of Montsalvatge’s Canción de Cuna Para Dormir a un Negrito brings a moment of respite to the general air of manic activity on the disc, See-Schierenberg, for all the expressiveness of his playing, lacks the warmth and generosity of tone this music calls for. 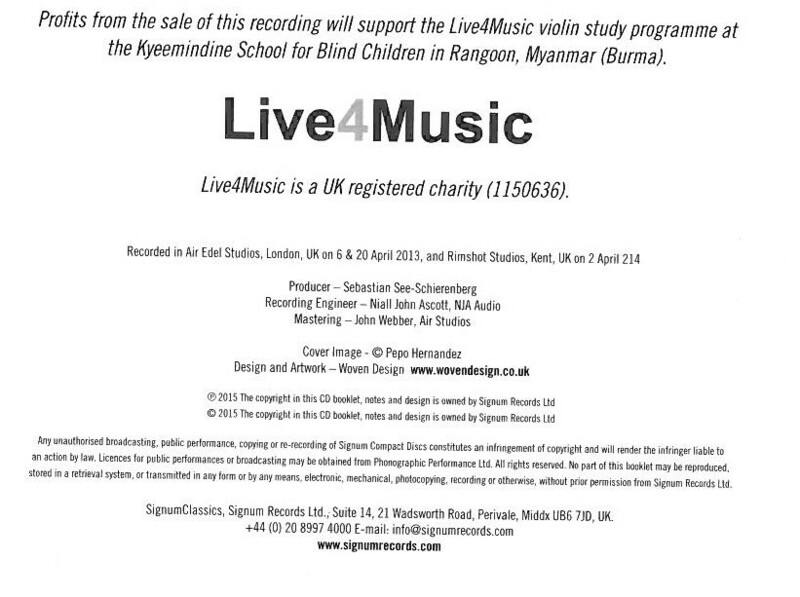 Sales of this relatively short disc (it’s a shade over 50 minutes in playing time) go to a charity which is close to See-Schierenberg’s heart (supporting the violin study programme at a school for blind children in Rangoon). 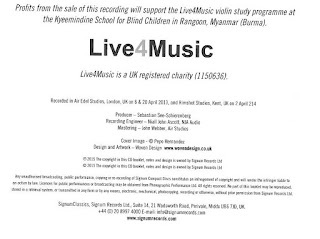 That alone should encourage sales; but even those hard-hearted enough not to be swayed by social consciousness or basic human sympathy should buy this disc. It’s an awful lot of fun, and full of genuinely welcome surprises.